You may not live in the city limits of Fort Pierce but you could be paying Fort Pierce taxes. Under the FPUA’s 2015 budget FPUA will direct over $5,500,000 dollars to the Fort Pierce general fund. Fort Pierce is using FPUA as a means to tax people outside the city limits of Fort Pierce. 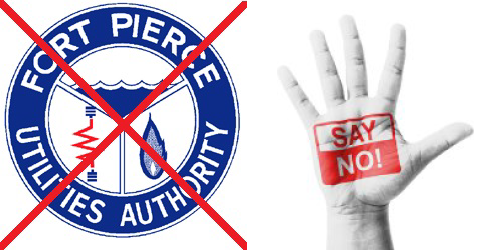 As provided for by the Charter of the City of Fort Pierce, Florida, a percentage of the FPUA’s utility systems revenue is distributed to the City’s General Fund on an annual basis. The distribution calculation is based on the preceding fiscal year’s audited financial statements. The distribution for FY 2014, payable in April 2015, is estimated to be $5,615,850, up $10,693 or 0.2% from the FY 2013 distribution paid in April 2014. The FY 2014 distribution will be paid in April 2015. The distribution for FY 2015, payable in April 2016, is estimated to be $5,538,306, down $77,544 or 1.4% from the distribution for FY 2014. The decrease is a result of the $1 per 1,000 kWh electric base rate decrease implemented March 1, 2014. 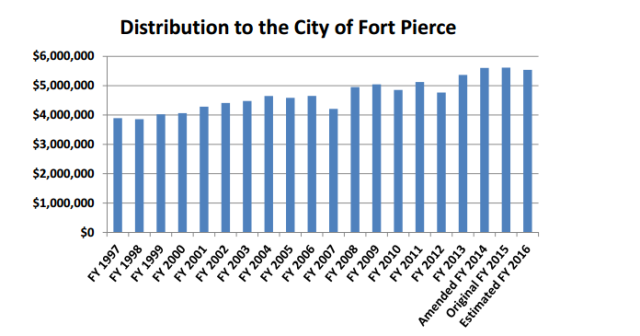 How much taxes has Fort Pierce collected through FPUA over recent years? Millions. For many FPUA customers they are being taxed by Fort Pierce without having a vote in Fort Pierce. This is taxation without representation in every sense. As the Treasure Coast goes hungry and Fort Pierce is likely the worst of which FPUA overcharges customers to make up for shortfalls in City Hall. If you think FPUA is doing good things for their customers then you may want to think again. Funding in the amount of $55,000 per year has been included in both the FY 2014 and FY 2015 budgets for a residential weatherization program to serve qualified low-income homeowners who are FPUA electric customers. Your “community” utilities has budgeted $55,000 to keep your costs down while siphoning over $5,500,000 to City Hall.